The Japanese number/logic game SuDoku has become all the rage around the globe of late, and in a shameless attempt to cash in on that popularity, Speculative Grammarian is pleased to concoct a SuDoku-like activity for Linguists. Traditional SuDoku requires a certain amount of logical reasoning and subtle consideration of the evidence which many linguists probably find time-consuming, labor-intensive, and boring. LingDoku simplifies the logical components of SuDoku, and introduces a thin veneer of linguistics which confuses outsiders while making linguists feel superior. The rules of LingDoku are straightforward. 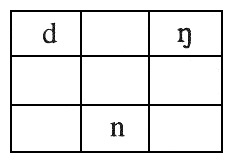 Using the nine IPA symbols in the table at left, complete the unfinished table at right. 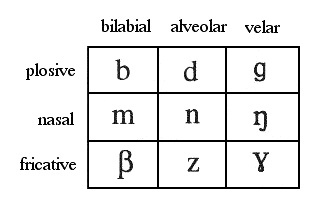 Each symbol occurs exactly once in the box, and no row or column may contain more than one symbol with either the same place or same manner of articulation. Like traditional SuDoku, LingDoku is at its core a constraint satisfaction problem, and could likely be couched in terms of Optimality Theory. I’m not sure. Our lousy summer intern flaked on us and I’m just too important to SpecGram to take the time to actually do the work myself—or lazy, I can never be bothered to figure out which. The solution, along with a new puzzle, will be given in the next issue of SpecGram. In all likelihood it will be the correct solution, but we make no promises.